Wir sind ein Musikantentrio, das auch in anderen Bands spielt. Wir haben langjährige Erfahrungen auf allen Ebenen im Bereich Motörhead Revival. Unsere Musik ist schnell, hart, laut und betonend. Gesang und Bassgitarre Antonín Jireš Pilsen, Sologitarre Adam Vágner Pilsen und Schlagzeug Marek Hemr Toporec a auch aus Pilsen. Unser Ziel ist, den Meister Lemmy Kilmister zu glorifizieren. Motörreptile, übersetzt als Motorenreptil, ist das Revival der bekannten Band Motörhead, das in Pilsen zu Ehren des Rockgiganten Lemmy Kilmister entstanden ist, der vor kurzer Zeit in den musikalischen Himmel gegangen ist. 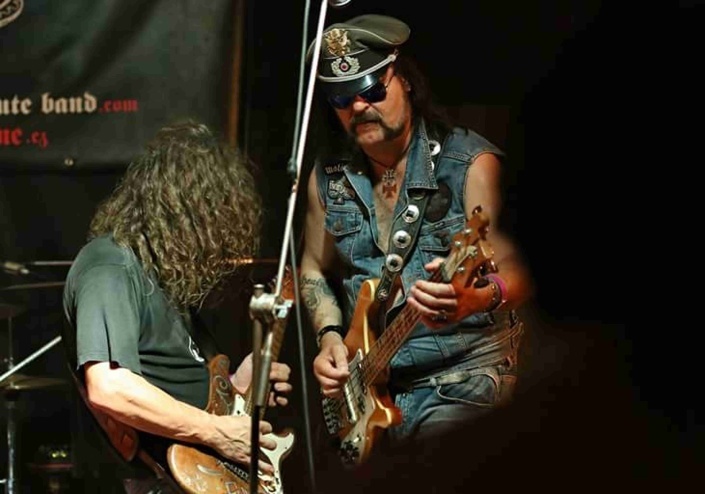 We are a trio of musicians who also play in other bands and together we have many years of experience at all levels regarding Motörhead revival. We play fast, hard, loud and strong music. Antonín Jireš from Pilsen is on vocals and bass, Adam Vágner from Pilsen is on lead guitar and Marek Hemr Toporec from Pilsen is on drums. Our goal is to celebrate the maestro that is Lemmy Kilmister to the best of our abilities. Motörreptile is a revival band of the famous Motörhead and were formed in Pilsen to commemorate the rock giant Lemmy Kilmister, who recently departed to music heaven. The man behind it all is a great admirer of Lemmy´s work and the front man of Motörreptile, Antonín Jireš from Pilsen. “I first heard Motörhead on the radio when I was in the eighth grade, it was the song Bomber. I remember experiencing a complete cultural resurrection. Motörhead became the true love of my life. In my opinion, the bass is very important.